If one couldn’t tell by the title of this article, I’m a huge Evil Dead fan. I got to meet Bruce Campbell in person and have an assorted collection of Evil Dead comics and movie props. I always wanted a movie replica carfor myself, and Sam Raimi’s “Classic” would be the first project I wanted to tackle. With this article, I’m going to share with you my trials and tribulations of owning and restoring one of Hollywood’s most “Horrific” vehicles to ever hit the silver screen. 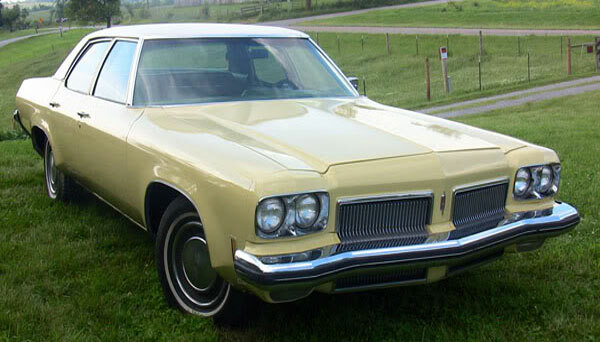 Sam Raimi’s 73 olds is a Royale Holiday Sedan. The most luxurious version of the Delta 88 model line. So I started my hunt for 73 Royale to make into a “Classic”. 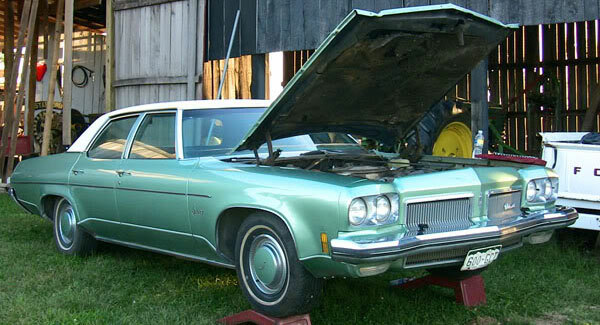 Most of the cars that I found were out of my price range and were already fully restored in mint condition. 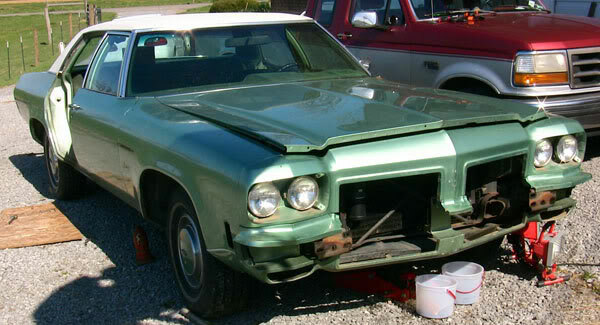 I needed a nice project car in which I could start modifying into a “Classic”. 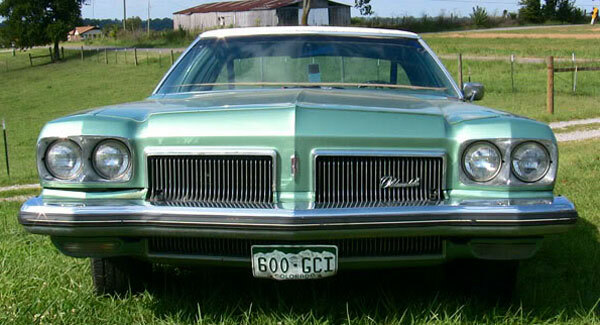 I eventually found my car in Hemmings Motor News after months of searching and bought it from a guy in Colorado. 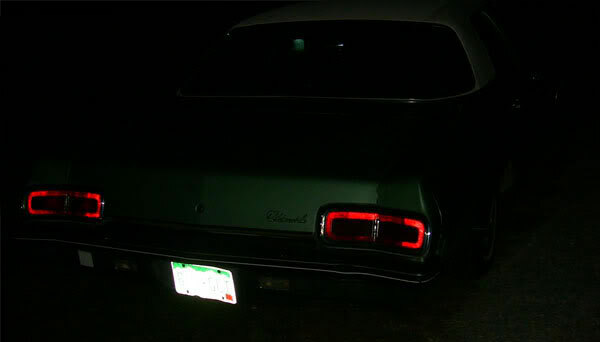 I hired an auto transport company to haul the car to my house and in the dead of night it rolled into my driveway. 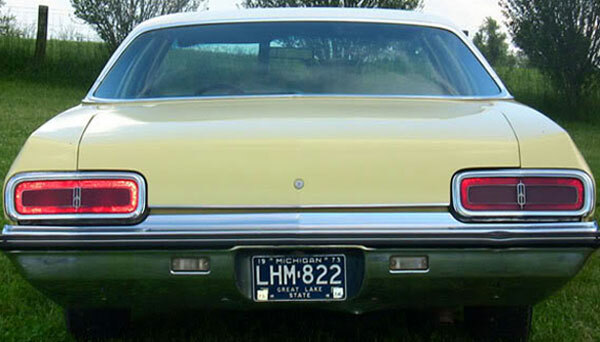 First off, my car is a 73 Delta 88 “standard” sedan. 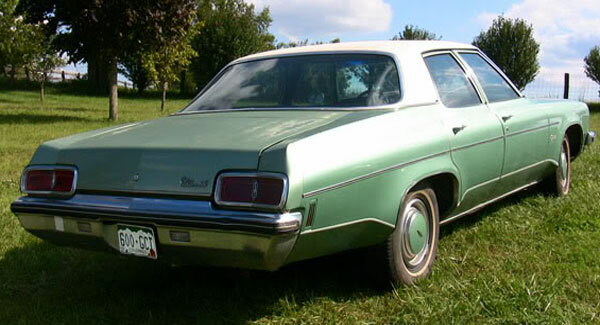 Meaning that it doesn’t have most of the features that the Royale Holiday Sedan has, but the body style is basically similar. And for those who aren’t avid Evil Dead fans won’t be able to tell the difference anyway. After the car was offloaded into my driveway, I put it on some ramps and gave the car a thorough inspection. 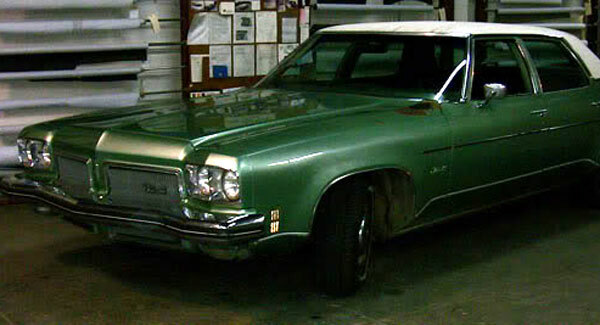 The car, despite it’s age, was in excellent condition. The chrome was perfect. All the lights worked. The car had new brakes put in it as well as a new alternator. 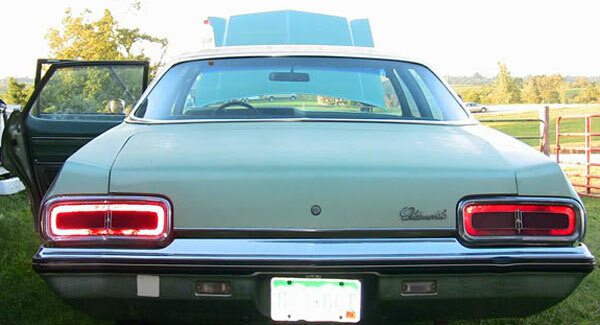 The engine was strong, despite high miles, and the transmission shifted flawlessly. 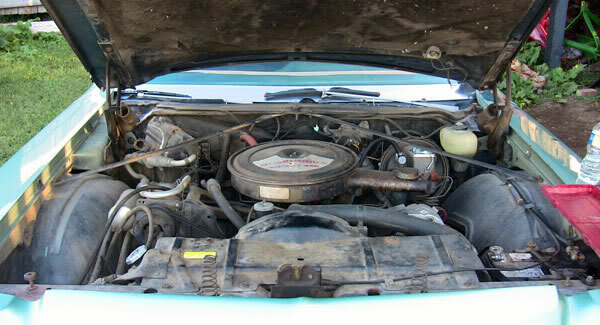 The car had a massive 455 engine and had virtually no rust damage whatsoever. The interior was perfect. The car also had some trouble spots as well. 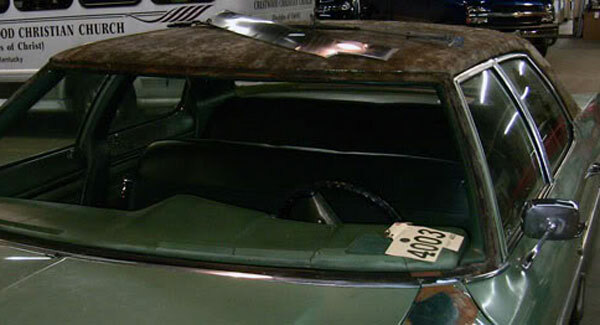 The car’s vinyl top was in poor condition and was leaking water into the interior. 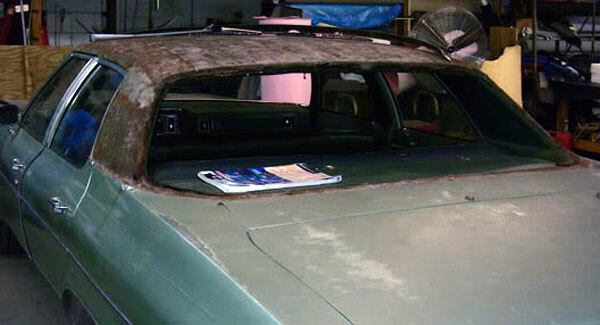 There was some rust near the rear window as it too was leaking water due to the poor vinyl top. The trunk filled up with water because of this. There was also a crack in the windshield, very tiny, but it was there. The car was extremely dusty and there are a few rips and tears in the headliner. The rear axle was leaking fluid and all the rubber weather stripping had to be replaced. The pressure line for the power steering hose was leaking fluid and the AC didn’t work. Did I mention the car was dusty? With my initial checklist of the car finished, there was one last thing to do. Start restoration. A complicated process in which I had thoroughly planned for, but dreaded like the flu. So first things first, start with the basics. Change the oil, check the tires, sweep, scrub and clean the car. I vacuumed tons of dirt and debris from the car and windexed the glass. 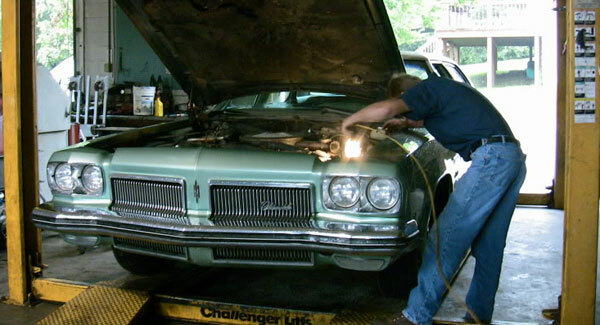 I changed the sparkplugs, switched out the marker lamps, got new wipers and cleaned the carburetor. Got both new oil and air filters, as well as buying a new battery. With some of the most basic stuff out of the way, I needed some help on some of the larger repairs. Like the vinyl top and rear axle. So I rolled the car into a local auto garage and they fixed the rear axle leak and power steering hose. What they did in a few hours would have taken me a week to do. So after they were finished with the car it was off to get the roof done. 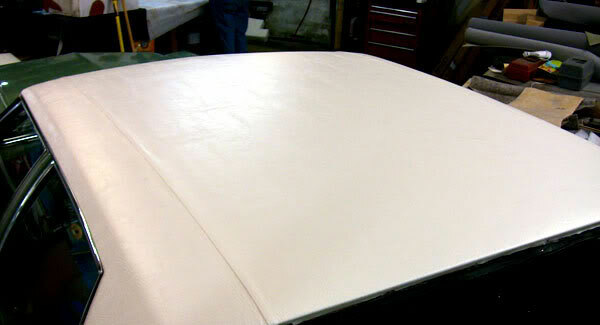 I wasn’t about to replace a vinyl top by myself, its not for the faint of heart or amateurs like myself. So after searching nearby towns and visiting 3 different counties, I found a guy that would do the vinyl top for me. I dropped the car off and the guy got right to work. He peeled the old top off and sanded the metal underneath. It was primed and sealed. At this time I also had both windshields taken out. To put new rubber seals around everything and to clean up a bunch of rust in the pitch weld area. The front windshield cracked during this process but was replaced. It needed it anyway. So after all the glass was done and top sealed, they put on the new vinyl top. No more leaks in either the trunk or interior. Which is fine by me. 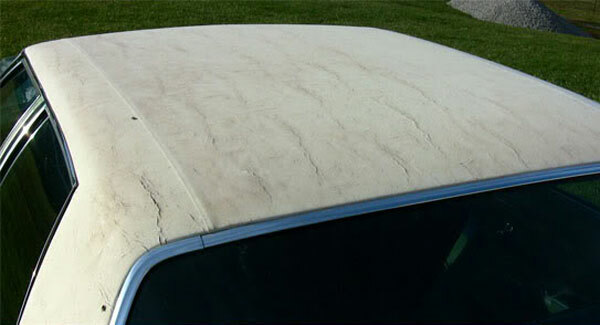 So with the new top finished I just needed to give the car a new coat of paint. So I then proceeded to prep the car for a new coat of paint. Everything had to come off the car that wasn’t getting the new paint color. All chrome, trim, lights, bumpers, etc. had to come off to make the paint process go that much faster. 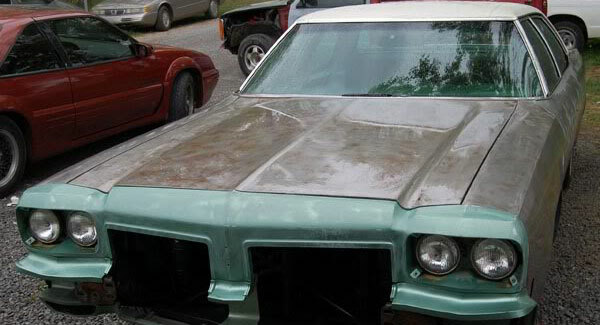 So with the car stripped to the bare metal I dropped it off at a shop to get painted. 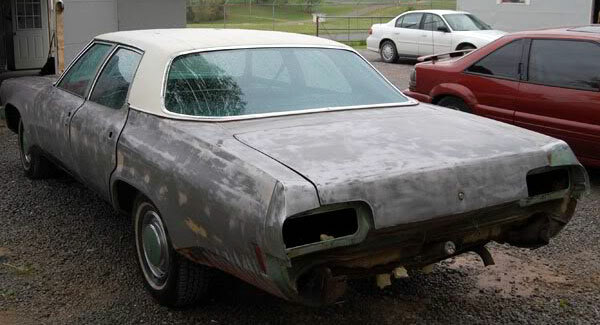 They sanded the entire car and stripped the paint to the bare metal. 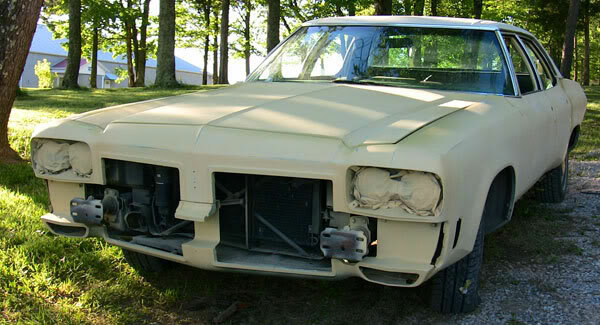 When the sanding was finished, dents and holes around the car where bondoed. They then put on the first layer of paint. Masking off the top and doorwell areas. The first layer dried and another coat of paint was put on. It had a nice glossy finish and looked amazing! Now reflecting back on this step I should have had the car painted first, THEN put the new top on. It was just another thing to tape around prior to any painting. 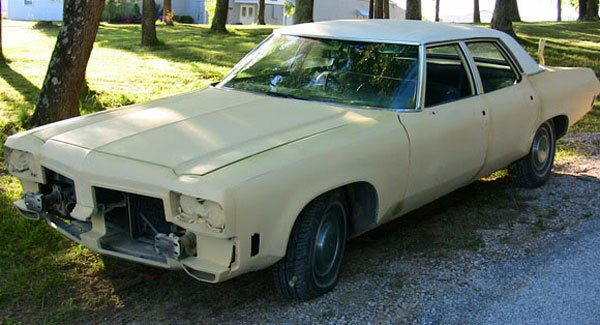 It was my first solo restoration job, so I was learning as I go. 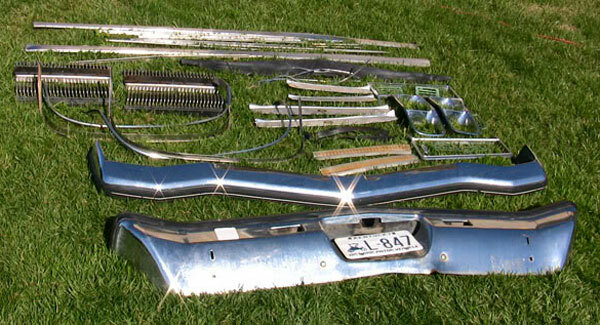 With the finished paint applied to the car all the chrome, bumpers, lights and metal pieces were put back onto the car. 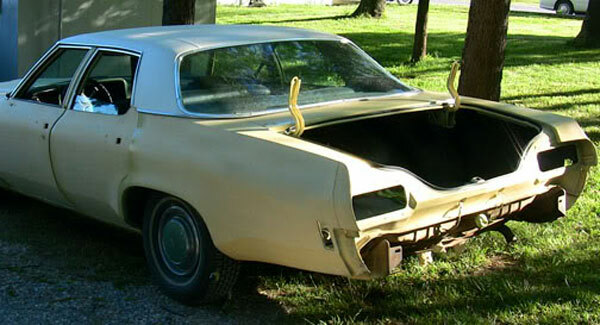 The car was complete. But not quite. With the car, for all intents and purposes finished, I wasn’t satisfied with the glass. I wanted all the windows tinted. 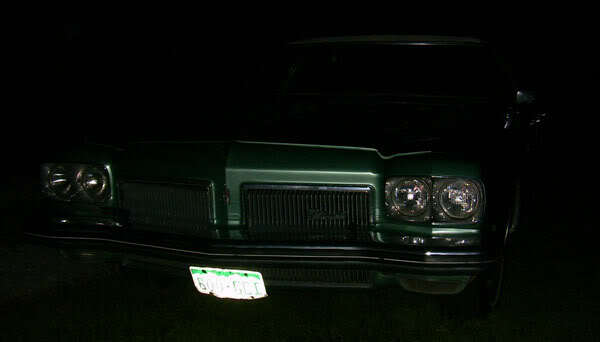 From afar, this would give the car a more sinister look, especially in the dark. It keeps the car cooler in the summer and protects the interior. 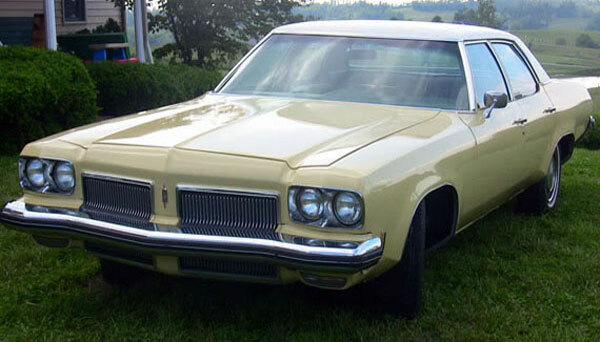 But most of all, the tinted windows hid the “incorrect” interior color. 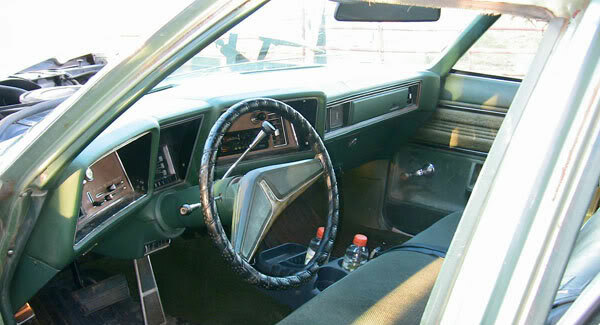 My interior was green where as Sam’s interior was white/tan. 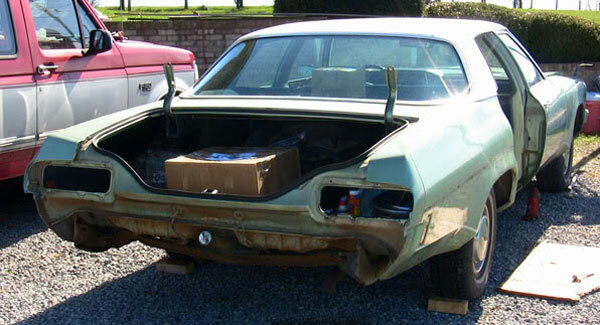 At this point I decided to stop with the restoration of the car. 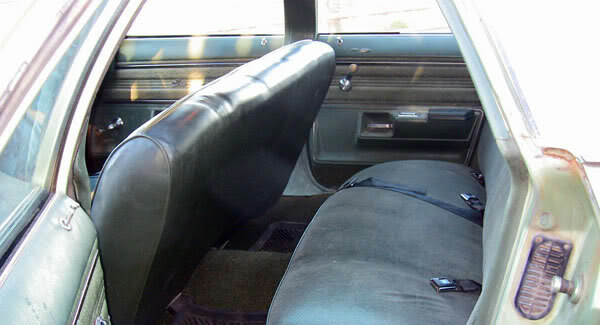 The interior of the car was perfect for a 30 yr old vehicle, but it was the wrong color. But only the Die Hard Deadite fans would know this, and I consider myself a die hard fan and perfectionist, so the tinted windows would help conceal the green interior. 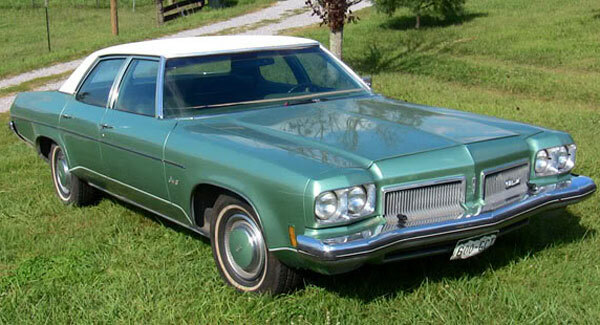 Which is sort of a moot point since my car is the “standard” 88 olds model and Sam’s car is the “royale” model. 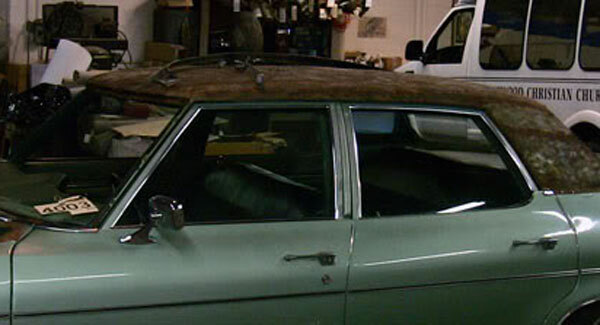 My quest for “super” movie accuracy is already hampered by the shear fact that my car is the “standard” model. But those “minor movie inaccuracies” would not be noticeable to the average eye and only die hard deadite fans, like myself, would know the difference. Which again, is a moot point, as Sam’s car physically changes movie to movie. Damage, trim pieces, and accessories on his “royale” jump back and forth from movie to movie. So what is exactly 100% “movie accurate” when the hero car changes so much? In the end, I feel that my car strikes a nice balance between the ED1 car and ED2 car. I’m happy with how it turned out and the car is awesome either way. As I bring this article to a close, I hope other Evil Dead fans have been inspired by my work and attempt to build their own “replica” car. 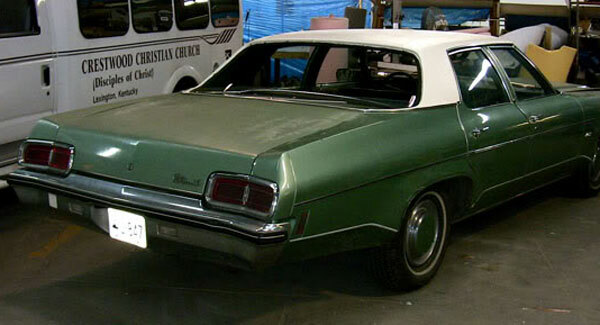 My car, if I am not mistaken, is the only fan made “Sam Rami” replica out there. 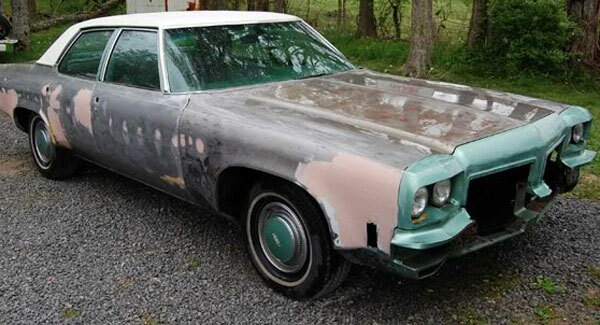 A car made for the sole purpose of recreating the Evil Dead car. My car comes complete with an Evil Dead movie poster and stand. I have a working tape recorder, Book of the Dead and other props that come with the car. I have a complete ED 2 Ash costume with chainsaw and shotgun. I have an S-Mart Ash costume and Army of Darkness medieval Ash costume with metal hand. I display all these props along with the car at shows and events. 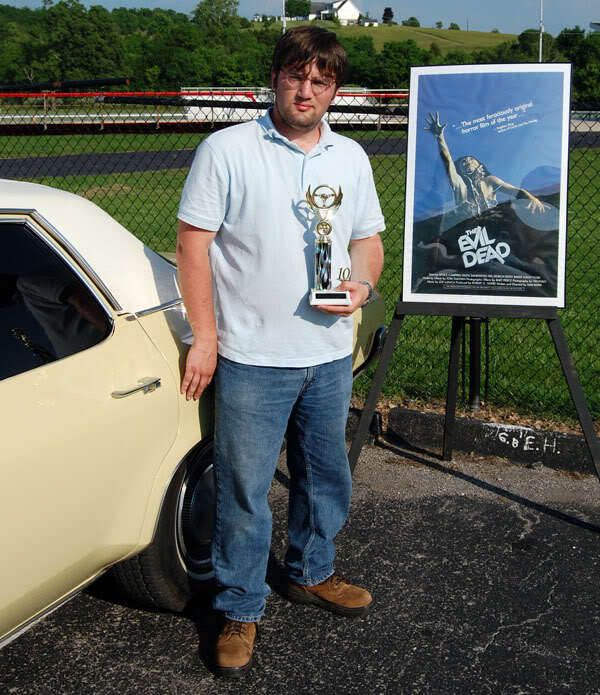 I have won two awards with this car. One award at a large car show with over 150+ cars and another award at a smaller car show. I get compliments on the car every time I take it out. People love it. I get stopped at the gas stations with people admiring the excellent restoration and overall look of the car. One time I was stopped at a traffic light and a guy two cars behind me jumped out of his car to congratulate me on an awesome car. It really is an awesome car. 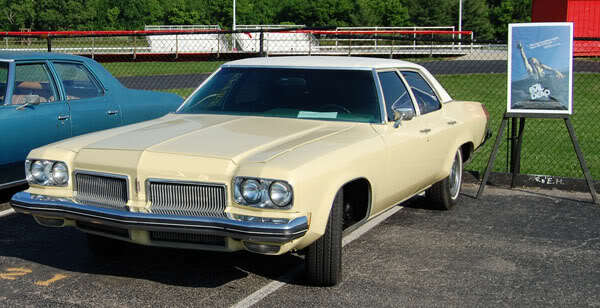 Made back during a time when Detroit actually put out amazing cars and before all the “bailouts” hit GM. The car is extremely powerful and has great pickup. I took it on a road trip from Lexington, KY to Chicago, IL and the car ran like a champ the entire way. It really floats along the highway and is a great car, regardless if it were a Rami replica or not. It truly is an American “Classic” and I hope you all enjoyed this article.